[intro] Looking for a clear way to show your customers just how much energy can be saved by switching to LED? 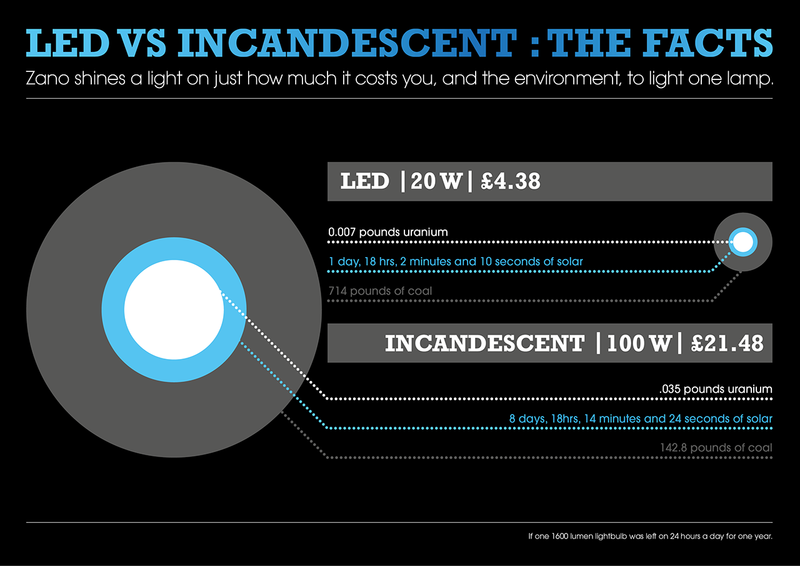 This infographic by Zano reveals the startling difference between LED and Incandescent lighting energy consumption. If one 1600 lumen lightbulb was left on 24 hours a day for one year, it would take…. ...to power that one bulb. The US Department of Energy estimates that the adoption of LED lights within 20 years could prevent 40 new power plants from being constructed. ● £21.48 per year to run just one 100 watt incandescent. Add a dimmer switch to your LED and you could cut the cost - and the emissions - even further, potentially reducing energy consumption by an extra 20%. Zano LED dimming products can help your clients save even more energy than just switching to LED. Find out more; visit www.zanocontrols.co.uk or tweet us @zanocontrols. Sources : World Economic Forum, Design Recycle Inc, US Department of Energy.